The Flow Line Controls NV62 is a 6-way, 2-position lever operated Lockout & Vent Valve that offers two primary functions. It may be used as pneumatic lockout valve and/or a vent valve. When the plunger is extended, air passes freely from the supply line to the pneumatic actuator. When the plunger is depressed, the supply air is locked out from the pneumatic actuator thus locking the actuator out of service by preventing it from being automatically stroked. At the same time NV62 vents the internal pressure from the actuator pistons to the atmosphere. 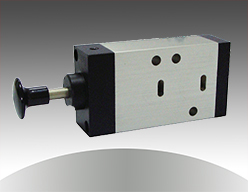 This allows the pneumatic actuator to be easily stroked manually and is ideal for de-clutch gear override applications.